Until June of 2001, the UCR Pipe Band had been using kilts supplied by members of the Caledonian Pipe band in the Ancient MacLaren tartan. By Commencement of 2001, however, the band was sporting kilts in the official UCR tartan, which would soon after be registered with the proper authorities. The UCR tartan , designed by Linda Clifford, Josh Taylor, and Robert Conacher (seen in photo below), was an instant success with the band and with the campus as a whole, where it quickly became an iconic representation of UC Riverside's Highlander spirit. The image shown above is an approximation; the blue is a "royal" blue, and the gold is slightly brassier and less mustard in color. 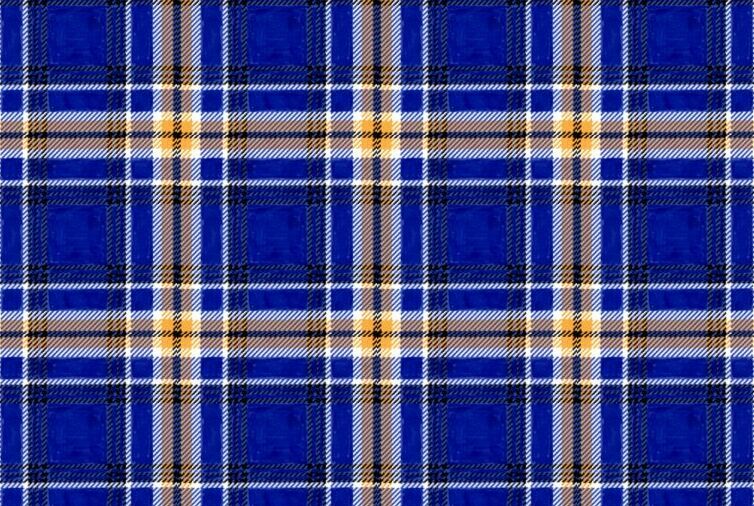 All graphic representations of tartan shown on this page remain the intellectual property of the University of California, Riverside Pipe Band, with all rights reserved pertaining thereto. Please do not use, copy, or reproduce the images shown.